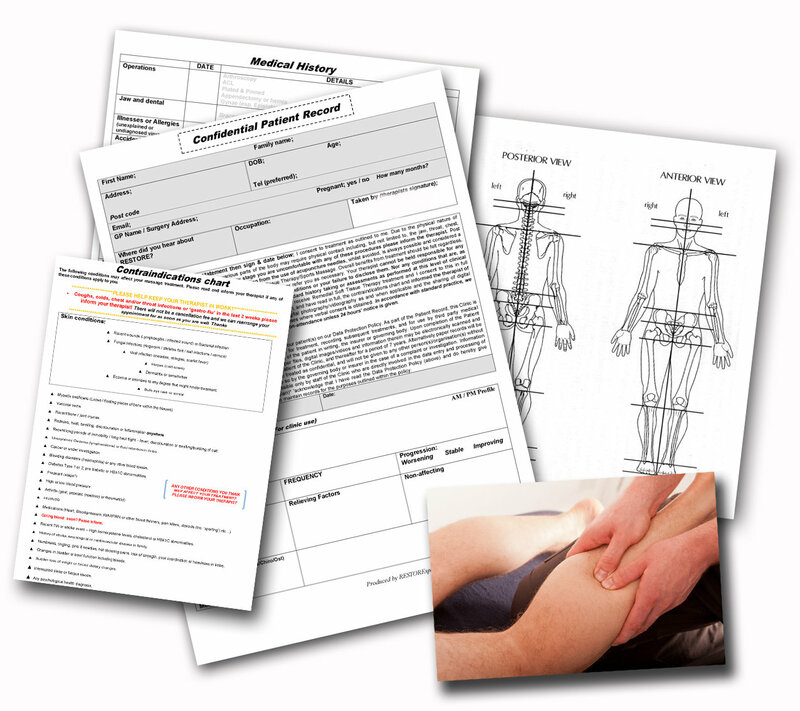 Professional Soft Tissue Therapy Patient Record Card Package. Updated based on 10yrs+ experience and usability. PROMPTS: Good history taking is the most important part of working with your patients. The medical screening interview page includes prompts in muted grey-scale that can be easily written over during the intake exam. This helps you to recall important screening questions to facilitate smoother, easier consultations in a relaxed and conversational manner that grab all the most important clues, data and flags. In those early days of practice it helps you to learn your consultation style on the job. These prompts will aid you in becoming more confident and efficient at getting the information you need. Simplified initial physical exam page. Time and experience has proven that this page is better kept simple, allowing you too write your observations and test results in the way that best suits you. You may find you use the occasional drawing, your own short hand, longer descriptive's, or even a flow diagram. This page has been set up to perfectly suit this freestyle requirement. Comprehensive disclaimer and data protection policy (including digital photo, video or motion analysis app usage disclaimer). Checked and approved by BALENS Specialist Insurance Brokers for Health & Wellbeing Professionals & Organisations. GDPR 'opt-in' confirmation box. Featured on the front cover this eliminates the need for further separate forms. One signature covers both statements and explicitly the GDPR opt in for a faster process. follow ups page. Package also provides an additional follow ups page for singular printing for long term patients. Example single joint assessment form including orthopaedic tests, muscle tests tick sheet, expected norms data and general findings area. Although rarely used in your early days of practice this can be a useful sheet to work through for learning purposes. Common physical therapy shorthand crib sheet. Upon purchase simply email your 'full pro record card' file to your printer and ask them to be produced as A3 prints on light card that can be folded to serve as an ongoing wallet for follow up sheets, scan results, reports and letters. Extremely useful. Other files can be printed as needed.